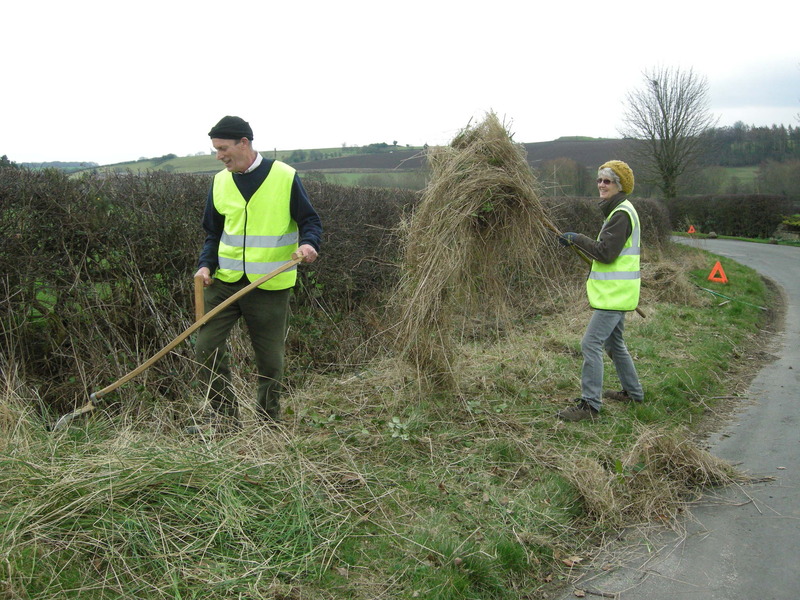 Having finally received the licence from Leeds City Council to “cultivate” our roadside verges, we decided, at short notice, to cut a small section of the grass verge along Moor Lane. An important part of this management strategy is to remove all the cuttings. If left, the cuttings would rot down and fertilise the soil which encourages the more vigorous grasses to grow which swamps any wild flower growth. Denuding the soil of nutrients favours the growth of the colourful wild flowers that used to be a part of our countryside landscape. 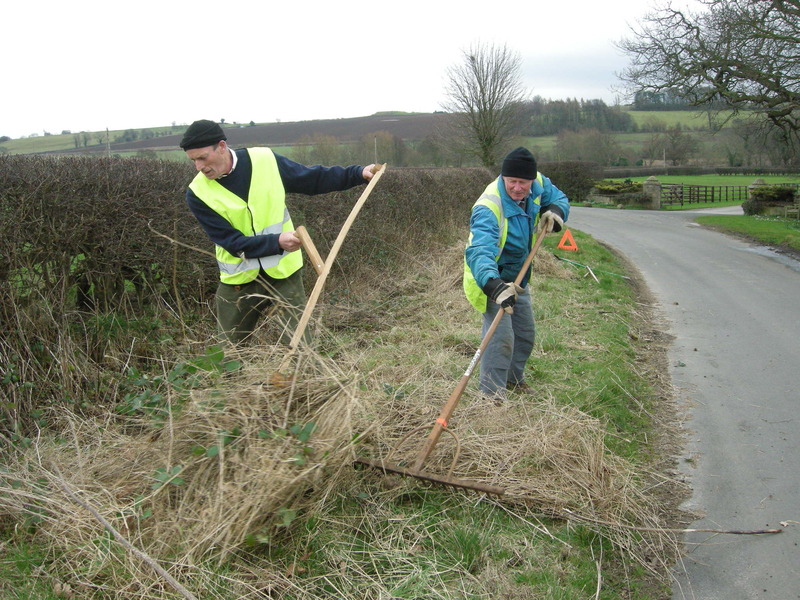 Cutting and raking the long, dead grasses along Moor Lane. Even though few cars were encountered, safety is a priority with roadside signs and fluorescent jackets. 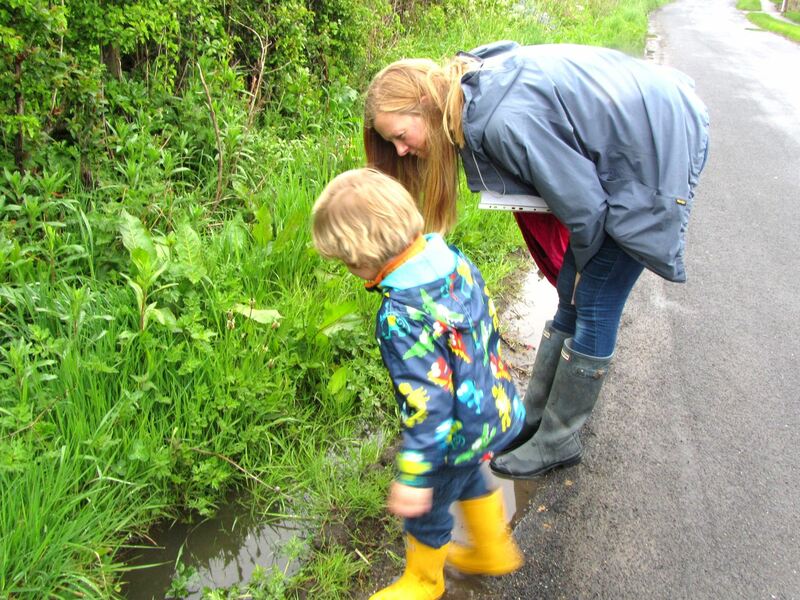 On the 18th May the Trust held a short, informative roadside verge walk to look at the variety of wild flowers and to see which verges might benefit from better management. Since then we have consulted with the Leeds City Council in order to re-schedule the cutting regime of the better verges. …. a close inspection of a roadside verge ! 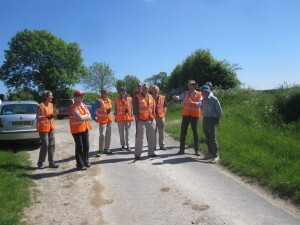 Then, on the 8th June members of the Trust visited Lincolnshire to witness the results of good roadside verge management. The day started with an enthralling talk by Mark Scofield, the leader of the Lincolnshire Wildlife Trust’s “Life on the Verge” Project. Mark recounted the origin of the project, it’s problems and it’s successes. After lunch we had a tour around the best examples of well managed verges which showed a tremendous variety of wild flowers and how this management obviates the need for verges to be cut more than once or twice a year. Trust members examining well managed wild flower verges in Lincolnshire.